I grew up in Venango County, yet I continue to meet new people, develop relationships, find new places, and experience new things every day. After graduating from Oil City High School, I decided to stay in the area to work while commuting to Clarion University. I didn’t hesitate when deciding what to do once finished with school—I knew I wanted to start a career and build my life right here in Venango County. 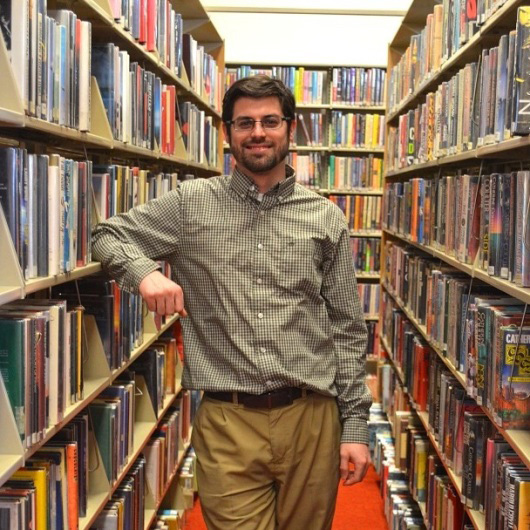 I began at the Oil City Library in 2011, where I currently work as the executive director. I have an absolute passion for what I do and have the pleasure of working in a great library, especially considering the size of our community. Having the opportunity to provide a positive impact in our area makes me ecstatic to come to work each day. I have a sense of responsibility for my own community, in which I’m able to help those in need, fill gaps in community services, provide resources equally for anyone, advance the local community, and meet so many varying needs. My wife, Ashley, and I have been fortunate to always find work locally and advance within our respective organizations. Besides working in Venango County, living here has come with myriad advantages. We purchased and personalized a nice, affordable home, where we live with our dog, Keasbey, and cat, Jim. We enjoy the proximity to important people in our lives who continue to reside here, including my parents, Ashley’s family, almost all of my six siblings, and several friends. On a daily basis, we love to take advantage of the amazing outdoor offerings in our area, in which we are never more than 10 minutes from woods or water. We take walks in the woods with our dog, visit Hasson Park to play disc golf, canoe the waterways, hike at Oil Creek State Park, ride our bikes on the trails, and play backyard games. We are lucky to be close to outdoor amenities in neighboring counties, too, in which we visit other local forests and parks. We are also able to take short drives to Pittsburgh and Erie and enjoy different experiences there, including visiting with friends who have moved. Although we enjoy our time traveling, we are always glad to return to our home. It amazes me when people say or act like it is impossible reach your potential in Venango County. I never imagined that I would have a successful career that I am so passionate about, while still having the opportunity to enjoy the natural, rural landscape mixed with the small-town amenities and ambiance right here in the Venango Area.